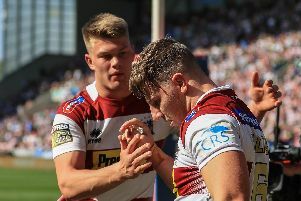 One criticism last year was the style of play - will fans see a difference to the way Wigan play? There’s a misconception that we need to be ad-lib... look at Castleford, they were great to watch last year, and yet they were probably the most structured team in the competition. They weren’t scoring tries from individual magic, it was more from executing patterns really well. But Shaun has said clearly that there will be changes – it’s not so much a change of style, but the individualisation of the team sport will have more emphasis – and the players have said this has been the toughest pre-season in years. We’ve looked at ways of re-energising the players. There’s an old saying, ‘keeping hunger in paradise’, and we have a lot of young players who have already won Grand Finals and a World Club Challenge. We’ve looked at how we can get the message across that the great players aren’t satisfied with one or two medals. Has the absence of any major recruit impacted on season ticket sales? No. We’ve very similar to where we were at this point last season. And when we’ve spoken to fans who haven’t renewed, yes there was a little bit of disappointment over the style of play, but the biggest factor which stopped them buying a season ticket was the competition structure with the Super-8s. The fact they don’t know who we’re going to be playing after July, and when, is a problem. And I think that’s why, last year, we saw a drop in season ticket sales, and yet our average attendance actually went up. Shaun and Ian have both previously mentioned the possibility of an attacking coach joining the club. Is that still an option? Yes, we’re always looking to improve. Over the pre-season we’ve looked for an additional assistant coach, and not found the right person. But we’re always on the look out. So are you already looking at recruitment for 2019? Yes – it’s a daily topic for us, and we’ve got targets who we think will bring value to the squad. We have got players coming off contract and players who are getting older. But it is hard, because there’s not a massive talent pool, which is getting smaller and smaller, and that drives players’ values up. I don’t want to knock agents, because they’re looking after their clients’ best interest – why wouldn’t they put their players to other clubs? – but we all suffer from it. That is certainly not true but may stem from the fact we’re marketing the tour quite heavily. It has been a huge task, and I don’t think we’ve got enough credit for it – we’ve been dealing with governments on both sides of the world, and we’ve got 37 stakeholders. The Super League game in Wollongong has to look like a match here, even down to the ‘man of the match’ boards and pitch-markings. We have two funding partners, Destination Wollongong and Destination New South Wales, and out of that money we need to pay for us and Hull FC to go over there, forfeit a game at the DW Stadium, buy in South Sydney, buy in St George-Illawarra, and make two stadium agreements. How we make money now is getting people to those games, so you will see us promoting this event heavily – we need to get people to these games to make it work. Yes, we’re pushing the boundary and yes, it will be good for Super League. But in all honesty, if this was a break-even trip, I don’t think we’d be doing it. We’re looking to make money out of this, and that money will be reinvested in the squad. Last year, we turned down a huge offer for George Williams, and made him our second marquee signing. But to pay for that, we need to come up with new ideas and innovative ways to make more money, and we have one here. Ian has always said he’s not the owner of Wigan to make money – any profits would go back into the club – but unfortunately because of higher squad costs each year and lower season tickets, Ian has had to inject £2m into Wigan over the past three years to cover losses. I know (going to Australia) won’t please everyone – if you want to watch Wigan at home, I understand why you may be frustrated. But if we don’t look at opportunities like this, there’ll come a point where we have to get rid of one of our best players because we can’t afford to keep him, and then we’d get criticised for that.